Rare Berkshire model. Two bedrooms, two baths. Unique bonus loft space with large closet and bookshelves perfect for office/den/playroom. Cathedral ceilings and a skylight give this unit an open, airy feel. Nothing but a tree view from living room and kitchen. Very private. EIK has granite counter tops, tile backsplash and sliders to private patio. Large living space with wood burning fireplace as well as second set of sliders outside. Retractable awning. Entry from garage makes loading/unloading a breeze as all living spaces (except master)are on main floor. Nice size guest bedroom on first level. Large guest bath with tub/shower combo, laundry. 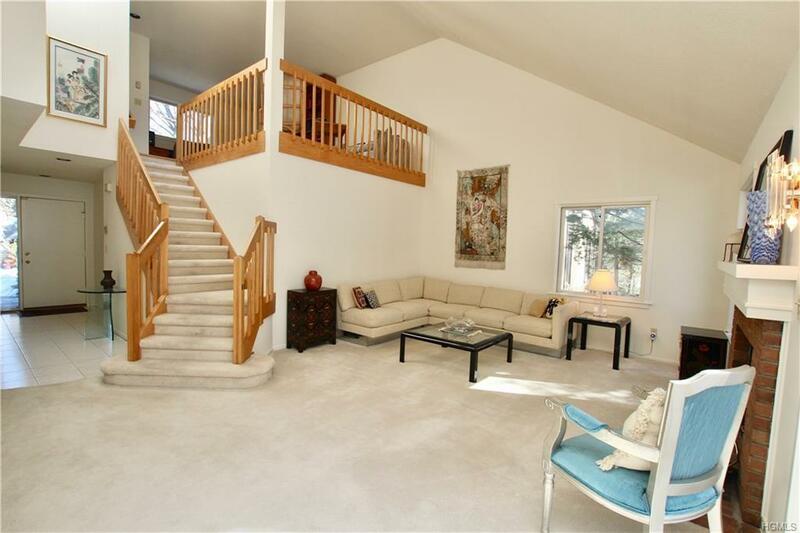 Second level includes private master bedroom with generous walk in closet. Master bath has large stand alone shower, separate soaking tub and double vanity. Central A/C. Fresh paint in every room. Enjoy Heritage Hills 5 pools, 7 tennis courts, golf ( for add'l $), 24 hour security, free shuttle to train and much more. Listing courtesy of Cathy Weissman of Houlihan Lawrence Inc..